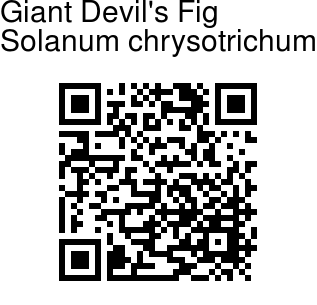 Giant Devil's Fig is a shrub or small tree up to 7.5 m tall, bearing prickles. Indumentum is star-shaped. Branches are densely hairy with rusty-brown hairs. Leaf-stalks are up to 11 cm long; blade 10-60 × 4-35 cm, broadly ovate to elliptic, leathery, rough; margin entire to deeply lobed with 7-13 rounded lobes, felty-brown-woolly and prickly beneath. Flowers are borne in cymes in leaf-axils. Calyx has linear or lanceshaped sepals, accrescent. Flower are white, 1.5-1.8 cm, petals ovate-oblong, 0.8-1.2 cm, pointed. Filaments are 1-2 mm; anthers oblong, 6-8 mm, style 8-10 mm. Fruits are green becoming yellowish to dull orange-yellow when ripe. Seeds are glossy, minutely warty. Giant Devil's Fig is native to Central America, now widespread. 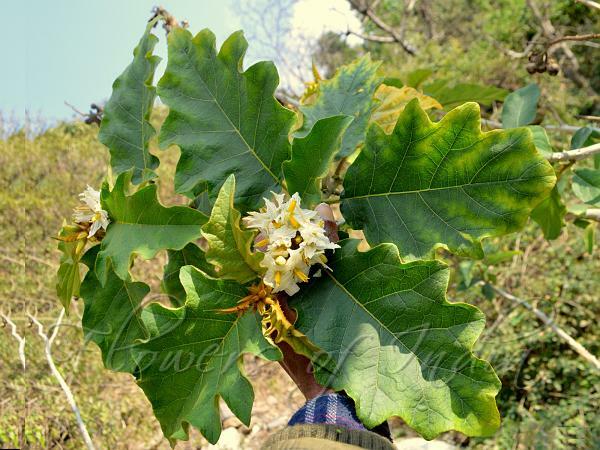 Medicinal uses: According to popular classification of diseases considered as skin infections, water extracts from the leaves of S. chrysotrichum constitute the specific treatment for tinae (tirlapedis), scabies and other mycosis. Identification credit: Joseph Mappilacherry Photographed in Kherson, Tehri distt, Uttarakhand.